Purchasing a toilet can be very frustrating, how you do you know which brands are good and should you buy a name brand toilet or a no name brand. Homeowners are trying to save money anyway they can but when it comes to the health of your family and your home, it is important to choose a toilet wisely. There are literally hundreds of different styles of toilets out there. But we can help with the selection. 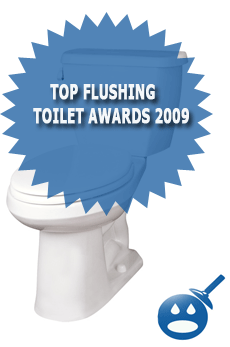 The Top Flushing Toilets of 2009 come from two companies, Gerber Plumbing Fixtures and TOTO. These toilets are a step above the rest because they are dedicated to high quality and high performance. But their best feature is that they are all energy and water conserving toilets. By choosing one of the three top flushing toilets you will not only save money but conserve water too. Let’s take a look at the Gerber Avalanche Super Toilet, TOTO Drake Toilet and the Gerber Viper Elongated High Performance Toilet. One of these toilets would work perfectly in your guest bathroom or master bathroom. You will find each has great benefits and specifications. You will also find that they are all competitively priced too. The Gerber Avalanche Super Toilet is the newest toilet in the Gerber Inventory. This toilet is 17 inches in Ergo Height with a 14-inch rough in. The Gerber Avalanche Super Toilet or model number 21-824 is ADA compliant, which means that it meets, and all of the industry standards and expectations. 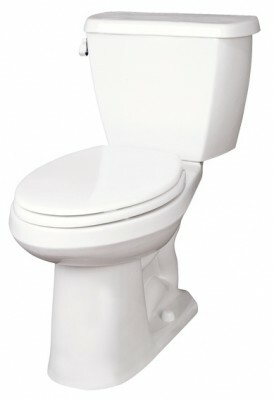 The Avalanche is a low water consumption toilet; this toilet is rated to use 1.6 gallons per flush or less. It has the capacity to get rid of 1000 grams of bulk waste. The Gerber Avalanche Super Toilet measures in at 18-1/4 inches in width, 31 inches in depth and 30-3/4 inches in height. The rim height on this toilet is 17inches and has a rim to water surface of 5-1/4 inches. The water seal that is used to keep water from leaking is about 2-1/2 inches. The Avalanche is designed with a nice slim line tank that has a side trip lever and there is a right hand tank lever option available too. 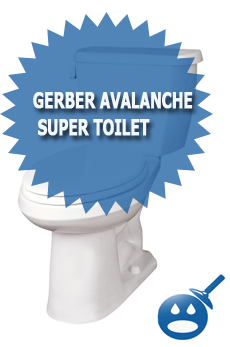 You will find the Gerber Avalanche Super Toilet has a reverse trap with a matching color tank level. This toilet comes in three different colors, Bone, White and Biscuit. This toilet is made from the strongest material, the Vitreous China. This toilet is built to last and it has an easy to surface. You will get a 10 year limited warranty on the Vitreous China and Pressure Vessel. It also comes with a 5 year limited warranty for other parts on the toilet. You can read the warranty information on the Gerber website. The Gerber Avalanche Super Toilet is priced affordably, this toilet price ranges from $500.00 but you can get a better price if you take the time to shop around. 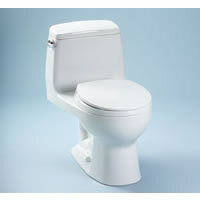 The TOTO Drake Toilet by TOTO is one of the most popular brands in the toilet industry. The company has been on business for over 90 years, the company uses the best technology and the best specifications. The TOTO Drake Toilet is available in 3 different styles the Close Coupled Round Toilet, High Performance Two Piece Toilet and the Eco High Efficiency Two Piece Toilet. Each of these toilets is rated with a 1.28 gallons per flush to a 1.6 gallons per flush. These TOTO Drake Toilets are the most efficient in the industry. The Drake Toilets are 125% bigger than the other standard flush toilets. The Close Coupled Round Tank comes with the G Max Flushing System and the E max Flushing Systems. These systems are designed to be high rated and high performance. These systems are put into place to guarantee an accurate and clean flush every time. Unlike the Gerber Avalanche who uses a 2″ trap way system the TOTO Drake Toilets are designed with a 2-1/8 inch trap way system. If you are looking for high performance and style and design the TOTO Drake Toilet are available in Cotton, Ebony, Colonial White and Sedona Beige. 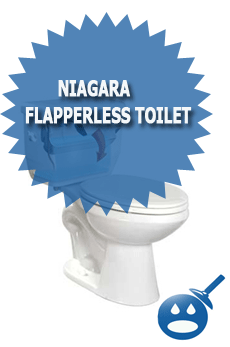 Each toilet has a 3″ flush valve and they are all made from Vitreous China. TOTO offers a 5-year warranty on the toilet and tanks. There are so many great ways to save money with the TOTO Drake Toilet System. You can start by saving money with the super low 1.28 to 1.6 gallons per flush. The prices on each TOTO Drake Toilet vary; the Close Coupled Toilet starts around $ 211.00. The High Performance Two Piece Toilet starts from $350 to $525 depending on which color you choose and the Eco High Efficiency Two Piece Toilet ranges from $275.99 TO $366.99 depending on where you shop. The Gerber Viper Elongated High Performance Toilet like the Gerber Avalanche is a low consumption toilet with a 1.6 gallons per flush and a waste removal of 600 to 750 grams. This toilet has an elongated bowl (model # 21-562) and a slim line tank (model # 28-590). All Gerber products are equipped with a Fluid Master 400A Fill Valve and 2″ Fully glazed trap way that will guarantee a clean and accurate flush every time. This toilet was tested by using a 2″ ball and that ball passed through the system without problems. The Gerber Viper Elongated High Performance Toilet is designed to be smaller than other toilets, this toilet measures in at 28-5/8 inches in height, 5/-5/8 inches in width and 29-3/4 inches in depth. This toilet is rated one of the best in the industry. This toilet will save you money on your yearly water bills, it is a low water consumption toilet and it has a reputation for being high performance. 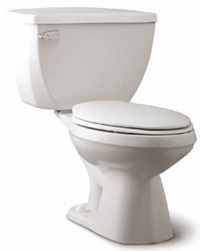 The Gerber Viper Elongated High Performance Toilet has a 10-year warranty on the Vitreous China and Pressure Vessel. Gerber also offers a 5-year warranty on other parts of the toilet. Many people prefer Gerber Viper Elongated style; it provides a big more comfort than round toilets. These toilets are easy to clean and will last you many years of service if you do your part. Avoid flushing things down the toilet that don’t belong such as cat liter or baby wipes. The Gerber Viper Elongated High Performance Toilet is available in three different colors, White, Bone and Biscuit. The cost is around $447.55 but if you do some comparative shopping to find the best prices. Gerber stands behind all of their products and they guarantee a reliable and dependable service every time. All toilets are made different; each has their own style, design and even different technology. But the Gerber Avalanche, TOTO Drake and the Gerber Viper all have one thing in common. That is low water consumption, each of these toilets offer a gallon per flush rating of 1.28 to 1.6. Each of these toilets offer high performance and high quality service that is hard to find in other brands. These are the top flushing toilets of 2009. To find the best choice, you should check out the company websites and read the installation instructions, specification sheets and the warranty information. You will be able to get the full picture of each toilet and everything that they have to offer. You will find all of the information that you need on these toilets and more. Any one of these toilets would make a great addition to your guest bathroom or master bathroom. So some price researching to find the best pricing for the best flushing toilets of 2009. Our 621 unit condominium is beginning the search for a company to help us choose the right toilets to replace the 800plus 4.o gallon models installed when the building was built in 1960. We are located in the District of Columbia. We may need color matched units . Has anyone tried an Imapala round front , elongated, or ADA yet? It passed the miso test at IAPMO with a + 1000. It is found under the Eclipse brand. They are using the Tower of Power 3 inch flush valve. It has been out in the market place about for 6 months. Only one toilet shows solid removal specification 600-750 grams. What are the others? Even 750 is not the highest rating available, many other brands have 1000 grams or higher removal, for example American Standard Champion 4. So why aren’t Toto and Gerber offering something at least as good as that? I’d like to buy a nice Toto, they look well made, and often made in USA. But most important thing is getting all the stuff flushed down the drain. Even Consumer Reports did not find that the Toto models had the best actual flushing performance.